When a patient is looking for services in their area, what will they see once they search for you online? Will they see complete profiles & reviews or will they find profiles with generic silhouettes of where your picture should be and little to no information about practice? As great as you and your practice may be, it must be reflected in your online reputation. The abundance of online review sites are often seen as a negative – more accounts to track and manage, and many of them pop up without warning (or your desire), but it is also a source of great opportunity. Below are a few ideas for how to monitor your online reputation and use the tools to your advantage. 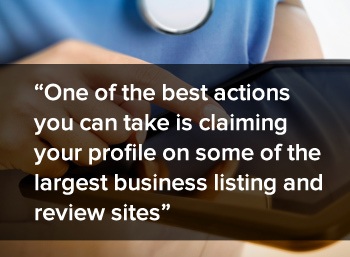 One of the best actions you can take is claiming your profile on some of the largest business listing and review sites. Once you claim your profile, you can ensure that the information about you or your practice is accurate and add a personal photo or a logo. When you to go the Yelp website scroll down to the footer and you will see a section titled ‘Yelp for Business Owners’ and in that section there is a link for ‘Claim your Business Page’. You will then need to search for your business by entering the business name as well as the location. After you setup your account, Yelp will call your business phone number with an automated message with a code to enter to verify that you own that listing. Google My Business works very much like Yelp. Once you go to the website, click ‘Get on Google’ and then you must enter business name and location and they will also either call you with a code or send it through the mail. You can go directly to the Local Marketing home page. This one can be somewhat difficult to navigate as they present you with offers for paid listings but below those offers is a ‘Yahoo Local Basic Listing’ for free. You then have to add your business information and it will provide you with a list of matches. Select the listing that matches your company and select ‘Claim Listing’. If none of the results match your business select ‘Create New Listing’. You will be again presented with an offer to buy services but if you scroll all the way to the bottom, you can select ‘No thanks! I only want to list my business on Yahoo »’. You can then choose how you would like them to send you your verification code. From the search bar at the top of the page, type in your business name and location and then click submit. Find your business on the results page and click on it (If your business does not appear, scroll to the bottom and there is a link for ‘add a business’). When you get to your business listing, there will be a link in the ‘Business Details’ section for ‘Claim this Business’. From there, follow the steps to claim your business. Just like with Yellow Page, from the search bar at the top of the page, type in your business name and location and then click submit. Find your business on the results page and click on it. Unlike Yellow Pages, if your business does not appear, you cannot add it automatically but you can send an email to customerservice@citygrid.com and request to have it added. When you get to your business listing, there will be a link in the ‘More Details’ section for “Own this business? Unlock this page”. You will then need to create an account, and will receive an automated call with a code to enter. Angie’s List makes it very easy to add or claim your listing. On the homepage, scroll down to the footer and select “Business Center” in the furthest right column. One the next page you can claim your business profile. You once again have to do a search by name and zip to see if it already exists in their database. If it is not currently listed, select ‘Add Company’ and fill out the rest of the information. On the homepage, scroll down to the footer and look under the category ‘For Providers’ to find the link for ‘Update Your Free Profile’. Start by typing in your name and your location into the form, then click “register now”. You can manage the profile yourself, or allow someone else to manage it for you. Visit to my.vitals.com and click on ‘Claim Your Professional Profile’. From there you can sign up and complete your information. In the upper right of the homepage there is a button for ‘Claim Doctor Profile’. Enter your personal information and once you verify your identity, you can update and monitor your listing. There are many ways to encourage patients to leave positive reviews without directly asking them. You can have signs in your office letting patients know which sites you are a part of or have claimed your profile. Let them know that their feedback is valuable and include all the avenues in which they can provide feedback. You can also create an area on your website to post testimonials from satisfied patients which can include feedback you’ve received via in-person, over the phone or online (keep HIPPA and patient privacy in mind as you make testimonials public). Sending follow-up emails encouraging patients to provide feedback and including links to your online profiles makes it easy for patients. Responding promptly begins with assigning someone to listen. Someone within your practice needs to be responsible for monitoring these sites daily, following up with the necessary internal staff, and responding back to the review promptly – within the same day. Even if their concern can’t be answered at that second, recognizing that you’ve seen the comment and are looking into it can go a long way. Negative reviews or comments can spread quickly, especially when it is left unanswered. If a review is positive, you can thank them for their review and kind words. If applicable, let them know that you will share their review with your team. This is another way to go above and beyond to let current and potential patients know that you value their feedback. You can create an alert with your name and have any mentions about you on the web sent to your inbox in real time. Similar to Moz, just enter your business and phone number and see what information websites have about you to ensure consistent information. Deleting comments or reviews won’t make them go away. In fact, it may make the situation worse. If a negative comment is placed on owned media such as social networks, it is best to leave the comment and respond to it appropriately. Otherwise, deleting negative comments can be perceived as something you are trying to cover up. Negative reviews offer great opportunity for your practice. If you notice a trend of comments, you can focus on improving those areas of your business. Of course, there are exceptions to every rule. There are times when it is appropriate to delete comments such as when they are offensive, in poor taste, violate a patient’s privacy, or if would violate regulatory/legal standards. You can always offer to address any personal concerns offline and provide your phone number. The goal is transparency so that even if you have to respond to comments offline, people who may be viewing the profile know that you are aware of the issues and are taking steps to get them resolved.